The East Grinstead 10k was the final event in the Oxted Runners Summer Series of six 10k races. The Series started in the un-summery freezing winds of March with the chilly and hilly Sevenoaks 10k. April saw us running the flat and fast Mel’s Milers course at Christ’s Hospital near Horsham. In May, we took on the Sutton Runners 10k on the first hot day of the year; we wilted. Polesden Lacey in June was scenic (i.e. very hilly) and it poured with rain; no one got near a PB and we all had fun. 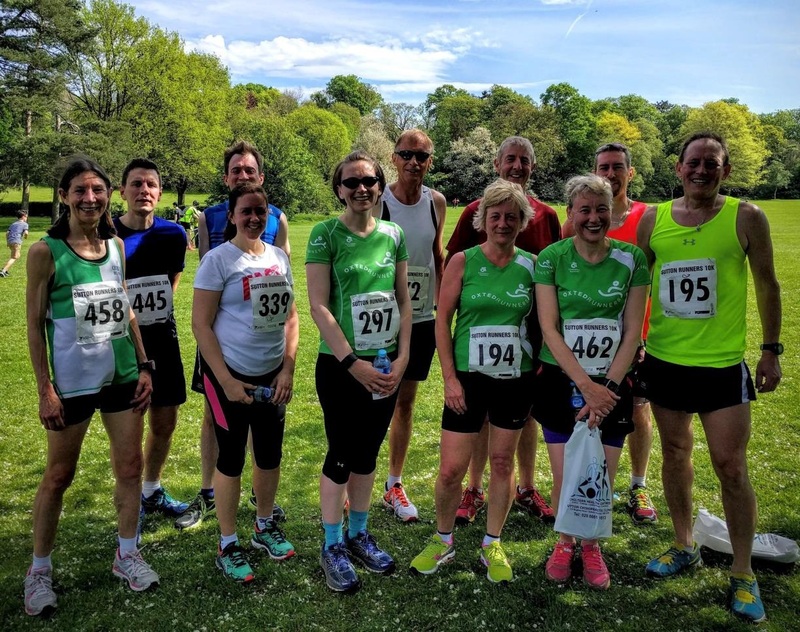 In July, the Oxted Runners took the Caterham 10k by storm, with Andy Irons winning the race, and Oxted Runners sweeping up most of the age group prizes. August was holiday time, and September was the finale at East Grinstead. The 10k distance worked well. Several runners took the plunge into racing for the first time and there was plenty of competition for more experienced racers. Mini prizes were awarded after each race for the fastest man and woman and for the fastest man and woman on the age-graded basis. A ‘one person, one prize’ rule was in operation, meaning that it was not possible to win both the open category prize and the age graded prize in the same race. The five races with women entrants were won by five different competitors – but Kim Sullivan scooped up most of the age graded prizes. Zhan Su and Andy Irons shared most of the honours for the men. Chris Sharpe’s 43:27 at Sutton was an excellent time on a difficult day. My win at Mel’s Milers (in a more modest time!) reflected the lack of entries for this race – a pity: it is a fast flat course in a great setting and I recommend it strongly. Andy Irons and Tony Saill won two age graded prizes each. The courses and running conditions were all different, so it is difficult to say which were best individual results, but I would mention two, for rather different reasons: Maggi Berry’s 47:09 at Sutton was good time in its own right and an outstanding age graded time, far better than anything that anyone else achieved in the Series; and Andy Irons’ win at Caterham was special because he was the overall winner of the event. *There were no entries from women in this race. 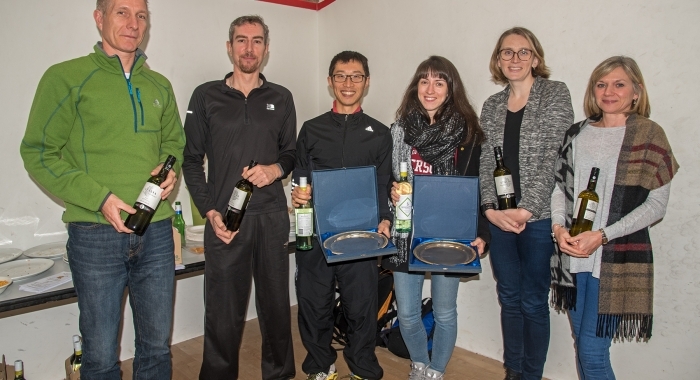 The Summer Series prizes are awarded to the runners with best times and best age graded results for the series as a whole, with their best three results from the six races to score. Two women completed at least three of the six races- Kim Sullivan ran in five races, and Sarah Lockett ran in three. Frances Gibson, Wendy Wilson, and Kirsty Merritt raced twice. Catherine Clifton, Maggi Berry, Louise Martindale, Sylvie Green, Lynn Hills, Jane McTaggart and Doriena Koldenhof all raced once. This is good news for Kim and Sarah as they are both bound to get prizes – the ‘one person, one prize’ rule ensures this! As the table below shows, Sarah Lockett gets the Open prize, while Kim Sullivan wins the Age-Graded prize. Age Graded percentages are calculated by dividing the world’s best time for your age and gender by your time, and expressing the result as a percentage. The faster your time, the higher the percentage. For the Summer Series, the age graded percentages have been calculated using the age-graded calculator that is referenced on the Oxted Runners’ website. The calculation uses the runner’s age in years on the date of the race – so if you ran exactly the same time in two races but had a birthday in between them, your age graded performance in the second race would be better than in the first. In the table, Kim had a birthday between her fastest and second fastest races, with the result that the second fastest turned out to be the better on the age-graded basis. 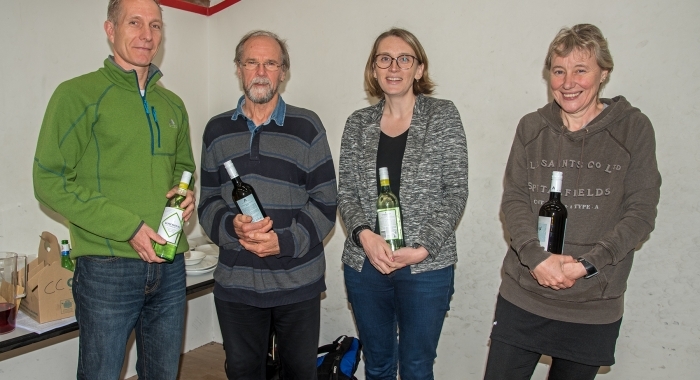 Eight men ran at least three races, three ran two races, and six ran one race (all of the ‘one timers’ ran in the Club Championship race at East Grinstead). As with the ladies, Caterham and East Grinstead were the favoured races, with runners discarding Polesden Lacey and Sevenoaks if they were able to – Polesden Lacey was a great run –pretty, but hilly – while Sevenoaks was probably a good bit longer than 10k (at least – that’s what our finishers said…). The table below shows the results for the open category. Andy Irons finished first with Sean McCabery in second place. The age-graded category results are shown below. Andy Irons proved himself to be not only a fast runner, but also a very good age-graded runner with an average of 72.4 %. In second place was Tony Saill, also over 70%. Tony gets the age-graded prize on the ‘one person, one prize’ rule. 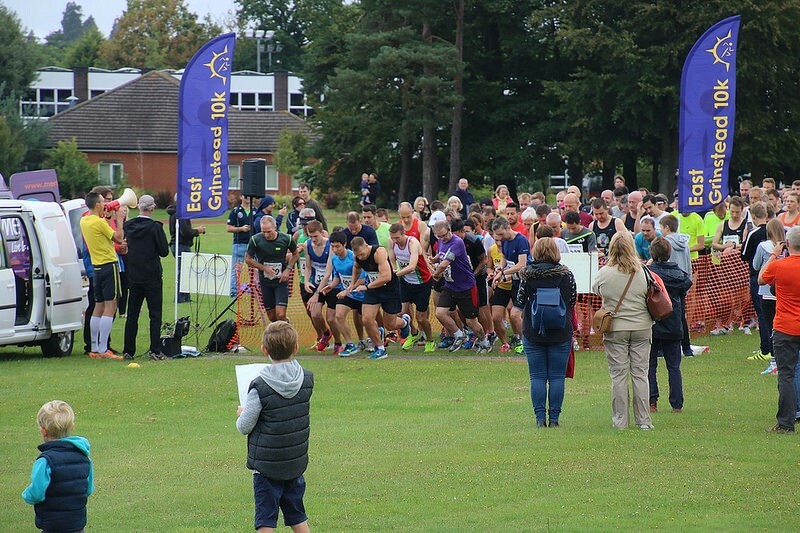 The summer season came to an end at the East Grinstead 10k, which doubled up as the Club Championships and the final event of the Summer Series. There was certainly an autumnal edge in the air as our biggest field of the summer season assembled to take on the tracks and paths around Imberhorne School. Conditions were ideal for running – not too hot, not too cold, and dry underfoot. The course is slightly undulating, with no steep hills but with some long gentle slopes that confuse you and disturb your pacing. The last km up the A22 is a proper hill which makes the run-in pretty tough. 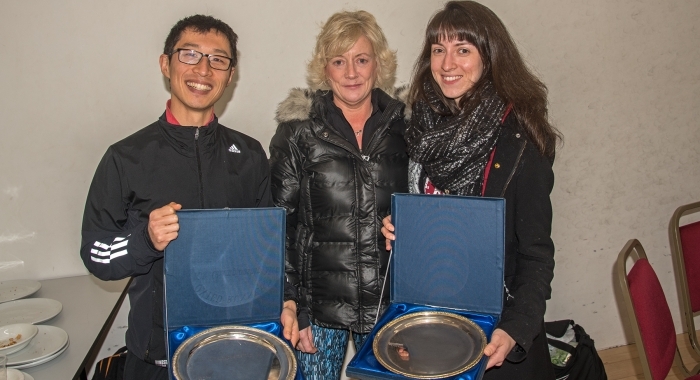 Zhan Su was the first Oxted Runner home, in 39:38, and is therefore our 2016 Club Champion. Zhan was 7th overall. Not far behind was Sean McCabery, in 8th place in 39:45, a personal best. Louise Martindale was our first woman back, and is our 2016 Club Champion. Her time of 48:46 was also a personal best. Louise was 65th overall and 7th woman home. Sarah Lockett was the second Oxted woman in 50:54. 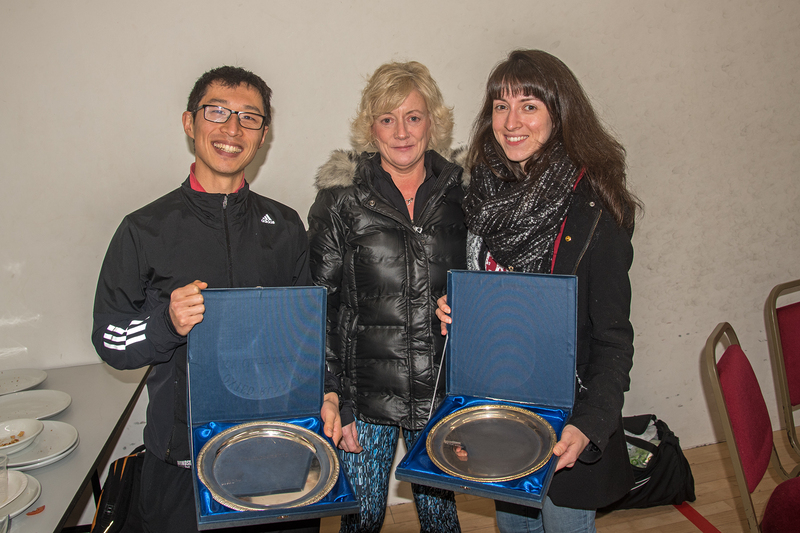 East Grinstead were a bit mean when it came to age group prizes! 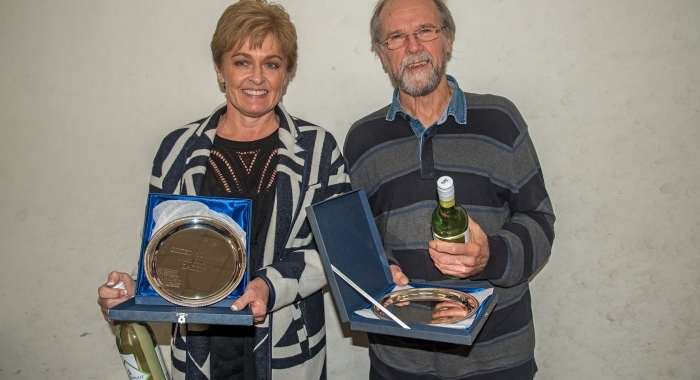 They awarded only four –for best juniors (m & f) and best vets (m over 40, f over 35). 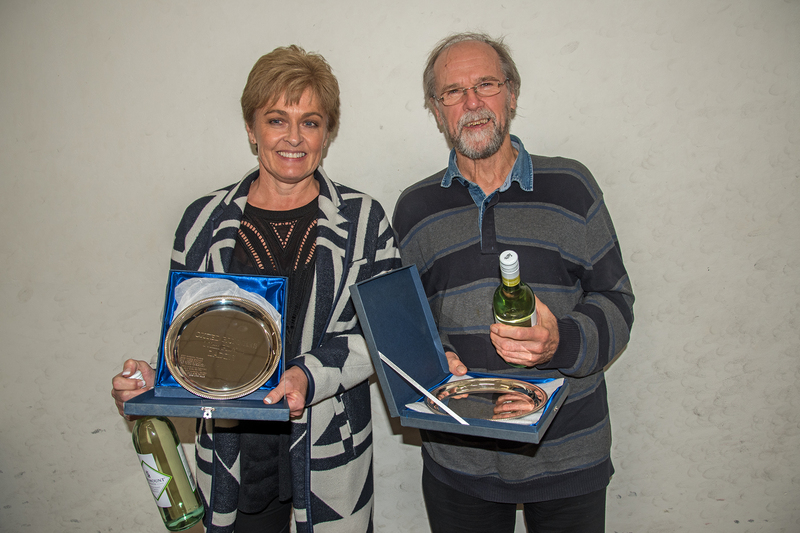 Not surprisingly, the vets prize for men was won by a youngster in his 40s and the vets prize for women by a youngster in the 35-45 age group. 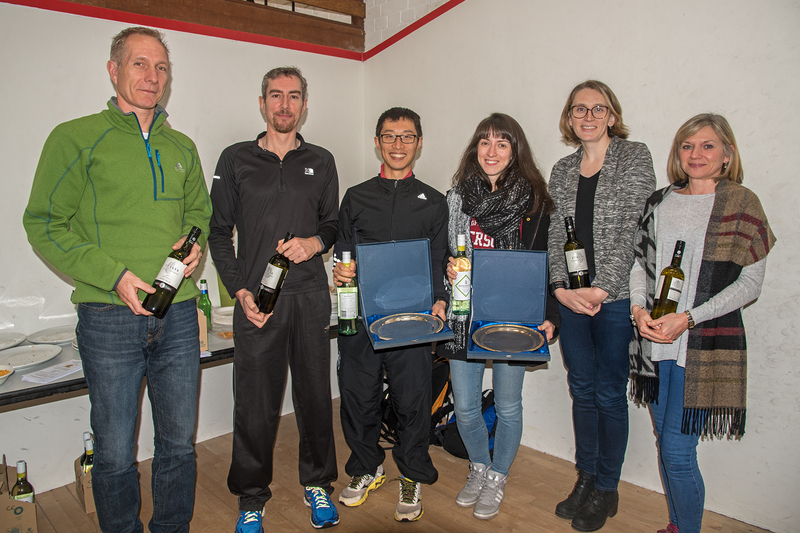 Nevertheless, the Oxted Runners did pretty well – Andy Irons won the M50-60 category, while I won the M60 category with Tony Saill runner up. Lynn Hills and Kim Sullivan were first and second in the F55 group. The Summer Series prizes for the best age-graded performances in this race go to Andy Irons with 74.7% and to Lynn Hills with70.0%. The overall Summer Series prizes – for the best three out of a possible six Summer Series races – will be announced as soon as I can work them out. These prizes, and the Club Championship prizes, will be awarded at the Club’s AGM in November. The sun shone for the Caterham 10k, held, confusingly, at Redhill Aerodrome. And the sun shone on the Oxted Runners, with Andy Irons winning the event, and ORs picking up most of the age group prizes. Weather conditions were very good for the race, run on an undulating course in the lanes around the airport. There were some longish drags, but nothing very steep. The trickiest sections were at the start and finish where the course was on rough mown meadow just inside the aerodrome. 163 Half Marathon runners started with the 110 10k racers. They went straight on at about 6k when we turned left. Andy Irons, in fifth place in the leading group, suddenly found himself on his own and leading the 10k event. Les Huitson must have ticked the wrong box – he went straight on for a 2:00:59 half marathon – well done, Les. Andy pushed on and won in 41:14, an excellent 72.9%, age-graded. 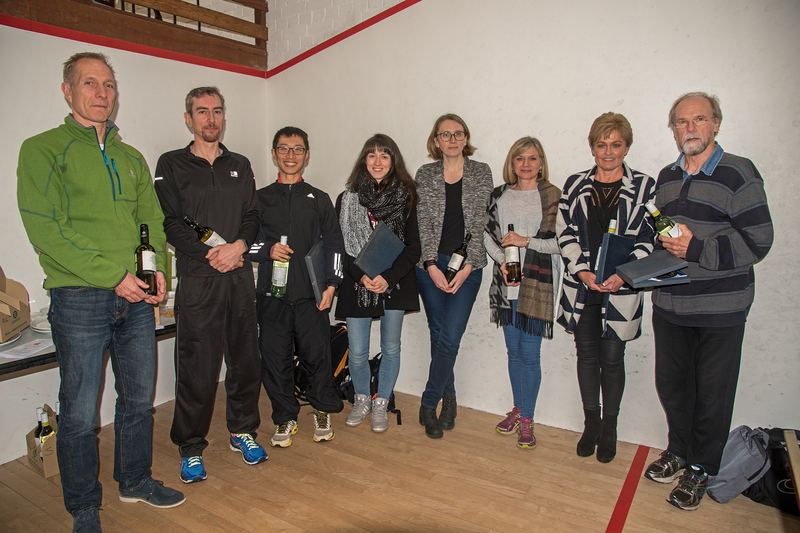 Chris Sharpe, Sean McCabery, Robin Hickson and Tony Saill all won their age group prizes. 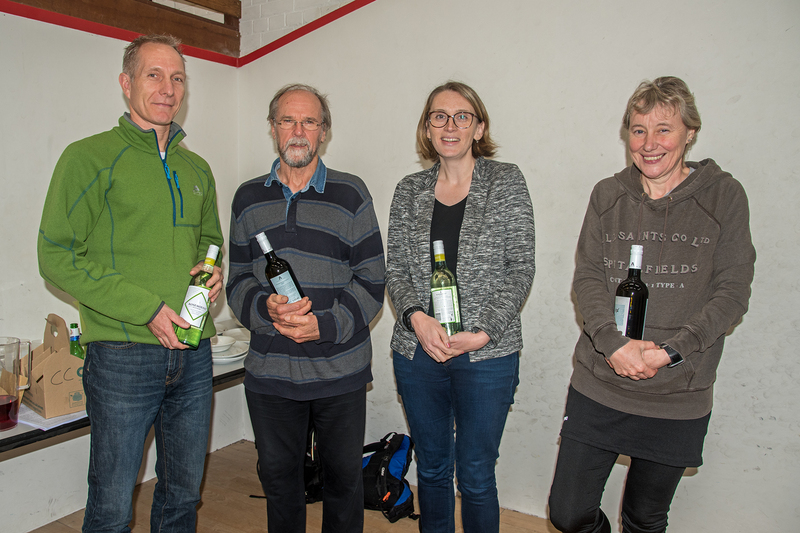 The Oxted Runners’ prize for the best age graded time by a man goes to Tony Saill with his very good 71.5%, on the one-prize-per-person rule. Sarah Lockett was the first Oxted lady home in 50:36; Sarah, Frances Gibson and Kim Sullivan all won their age categories. The OR age-graded prize for women goes, once again, to Kim Sullivan, with her 66.8%. Apologies from those of us who did not manage a category prize: we promise to try harder next time. The final Summer Series race will also be the Club Championship race, so a big turnout is to be expected. I hope to see you there. Eleven Oxted Runners assembled in the Sunday morning drizzle. The course starts flat (fine) then goes down steeply (which fills you with foreboding) and then rises, and rises, and rises (you were right to be foreboded…). After that it is all down, up, down with scarcely a flat bit until you get near the end. Just like plenty of Tuesday runs, then. But very pretty views. Zhan Su was the first man back in 42:59 and was 14th overall in a field of 372. Andy Irons was 15th, just behind in 43:10. 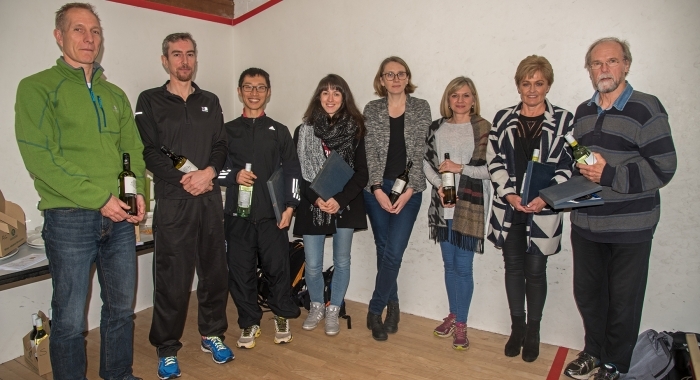 Andy’s time was enough to win the age graded prize with an excellent 69.6%. Runner up in the age graded category was Tony Saill, whose 52:08 was worth 68.6%. Wendy Wilson and Kim Sullivan were our only women in the field. Wendy (60:41) got him just ahead of Kim (60:50), with Kim taking the age graded prize with 59.9%. In the very exclusive ‘Sullivan’ class, Pat beat Kim for the first time over this distance, and was in full dog with two tails mode. Kim not 100% impressed! The race in Nonsuch Park, Cheam on 8th May lived up to its ‘Summer Series’ billing. It was bright sunshine, and already warm, as we arrived at about 08:15. It got steadily (much) warmer, and was over 23 C as we made our way home. The course is mostly on tarmac paths inside the park, with a section on pavements outside the park. The sudden summer heat was definitely an issue on the day, but the course, good underfoot and with no significant gradients, has definite PB potential. Eleven Oxted Runners took part. Pick of the day was Maggie Berry’s 47:09; Maggie was 1st in her class and 183rd out of 459 finishers. Sarah Lockett was the second Oxted woman home in 51:51; Kim Sullivan picked up the age-graded prize under the ‘one runner, one prize’ rule. Amongst the men, Chris Sharpe was first home in 43:27; Chris was 114th overall and 29th in his class. Sean McCabery was not far behind in 43:55 in his first competitive 10K. Well run, Sean. The age graded prize went (narrowly) to yours truly, S Brooks, which just goes to show that in the age graded game it can be more important to be old than quick! A vintage selection of Oxted Runners competed in the second round of the Summer Series on 3 April – Tony Saill and me, Simon Brooks. The race, the Mel’s Milers 10k, starts and finishes in the grounds of Christ’s Hospital School, near Horsham. The historic buildings are an impressive setting for the race, and Mel’s Milers are able to use the facilities of the school, including its carparks. Not surprisingly, the race was very well organised and marshalled. The course itself is fast and flat, mostly on tracks, with only a few hundred metres on quiet residential roads. Tony and I made a good decision to sign up for this race as our first participation in the Summer Series. In great running weather, and with just a few muddy puddles to make the course interesting, the race promised fast times. It was won in 33:48, about five minutes faster that the first Summer Series race in Knole Park, Sevenoaks. I was the first Oxted Runner home – 94thout of 300, in 48:17. Tony was the first Oxted Runner on the age graded basis, coming in 126th in 51:31. In the all important M60-69 category (I know that some readers will find this bit as interesting as non-league football, but bear with us: Your time will come…) I was 3/23 and Tony was 8/23. Once again, flapjacks, brownies and bananas were consumed around the Oxted Runners banner, and we both agreed that we had had a good time, and that the Summer Series is a good thing, even if the weather is not yet summery enough for everyone! 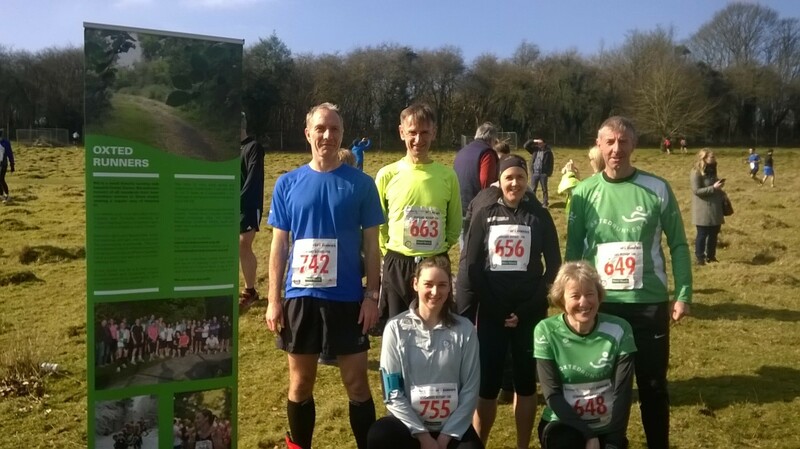 A small but select group of Oxted Runners gathered in Knole Park on the morning of Sunday 13 March for the first race of the 2016 Summer Series. Perhaps the early morning fog and chilliness made some others think that spring had not yet arrived, let alone summer, and that a little longer under the duvet would be a better bet. If so, they made a bad call! The mist soon cleared and the race was run in bright sunshine. With the temperature now excellent for running, and with underfoot conditions good, it was a surprise that the first runner home completed this delightful course in a little over 39 minutes. As more and more runners came in and consulted their watches, it became clear that the course was a bit longer than 10 k – more 6 ½ miles than 6 ¼. First Oxted Runner back was Andy Irons in 45:51, 28th overall, and 4th in the M50-59 class – not bad for someone who had completed 15 miles of marathon training the day before! Kirsty Merritt was our first woman back in 57:38, 47th woman home and 21st in her class. Andy would have also won the age graded race for men, but on the one prize per person rule, this goes to Robin Hickson. Kim Sullivan wins the age graded race for women. Flapjacks, brownies and bananas were consumed around the Oxted Runners banner, and everyone agreed that they had had a good time. I was gutted that I was still not fit enough to compete – but next time it will be different. The next race in the series is Mel’s Milers 10k on 3 April. Should be good – hope to see you there. Note: Because the course was probably longer than 10 k, the Age Grade % figures In the table will be a bit too low.